Amount of time devoted to this game in the last week--Four hours, two minutes. Most recent boss toppled, location reached or milestone achieved--Sadly, I'm still working my way through this game's second stage, which won't mean much to those of you who've yet to play the game (and may not even mean much to those of you've actually played it, truth be told). Also, I've competed in--and was declared the victor of all but one--five of Pop Cutie's fashion battles so far. Overall comments on the experience--To be completely honest, I bought Pop Cutie! assuming it was going to be little more than a half-assed knock-off of Nintendo's criminally under-appreciated (outside of Japan, at least) Style Savvy games. After all, though the two titles mentioned above are similar in terms of theme--both focus on fashion and on running a clothing shop--that's where the likenesses end. The aesthetics of Pop Cutie! 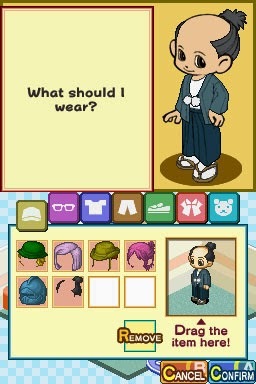 are far, well, cuter than those of Style Savvy, for starters. Specifically, whereas the latter's art style leans toward slick and even sophisticated, the former's is more "precious" and cartoonish. Speaking of which, the look of Koei's (yes, the same Koei that brought the world the Dynasty Warriors and the Nobunaga's Ambition series also made Pop Cutie!) contribution to the portable fashion genre is sure to turn off more than a few people at first glance. Hell, my initial reaction to it was to scrunch my face in sour disgust, and I tend to like adorable-looking games more than your average Joe. Over time, though, the weird aesthetics of Pop Cutie! grew on me to a surprising degree--to the point that I'm nearly ready to say I actually kind of like them. Anyway, Style Savvy and Pop Cutie! also differ pretty substantially in terms of how they play. In the former, designing clothes and running a "très chic" boutique are fairly detailed, hands-on experiences, and players are given a lot of control over how they accomplish those tasks. The corresponding activities in the title that's at the heart of this post, on the other hand, feel far more "detached," if that makes any sense. Don't take that as a complaint, by the way. Although I found this cart's gameplay a bit basic and even disappointing at first, I had a pretty drastic change of heart after wrapping up my first hour or two with it. Now, I find the whole she-bang to be sweet and endearing and breezily fun. Will I continue to play this game in the coming days, weeks and maybe even months?--If I'd have had to answer this question a week ago, I likely would have said, "I doubt it." Today, though, I'm far more open to the idea. Once you come to terms with this game's quirks--its sometimes-awkward controls, its far-from-appealing-at-first art style--it's actually quite a lot of fun. As such, I have a feeling I'll put at least a few more hours into this cartridge before it goes back into its pastel-plastered case. Do I recommend it to others?--I guess so, but with some reservations. What I mean is that I think only a small percentage of people who own a DS or 3DS are likely to bother playing Pop Cutie! long enough for it to get under their skin, so to speak, so I'd say that if you've spent some time with any of the Style Savvy games (or anything remotely like them) and enjoyed the experience, you may want to give this one a go, too--especially if you can find a fairly cheap copy. I was interested to hear your impressions of this one, Bryan. Your review renewed my desire to get Style Savvy. Maybe that's not what you intended...but...there it is. Hey, if this write-up prompted you to re-consider Style Savvy, Justin, I've done my job. 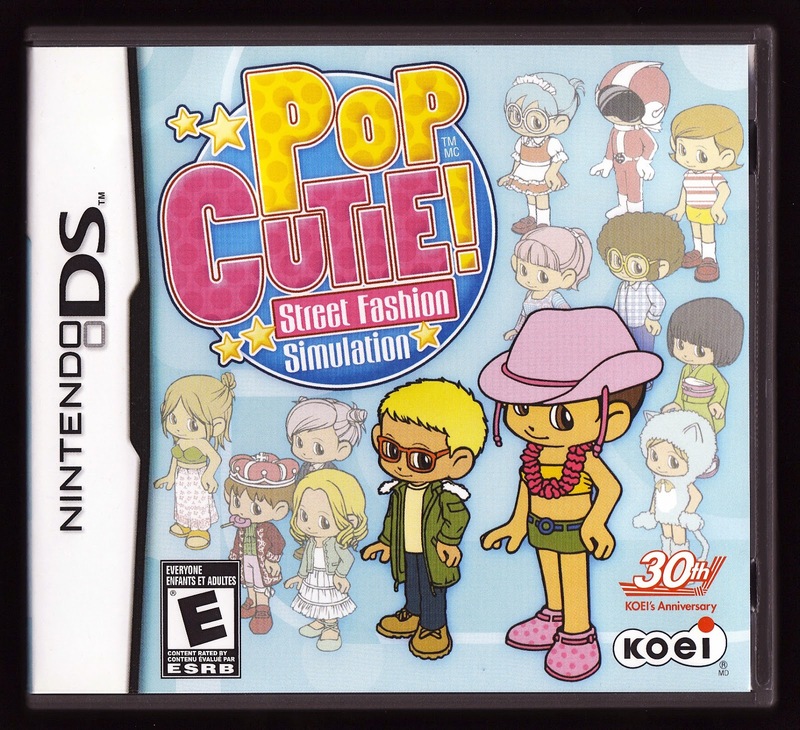 I mean, Pop Cutie is fun and well worth playing, too, but Style Savvy's undoubtedly the better game, IMO.